Danny and Ryan team up for a special project with legendary custom painter Jon Kosmoski to paint an old DIVCO milk truck. While Ryan and Mike are meeting Jon and his team at House of Kolor in Minneapolis, Danny heads to Shelby American to check out their latest masterpieces, including a beautiful 2017 Super Snake and an historic GT40. Most people in Las Vegas bet with chips, but Danny "The Count" Koker bets with cars. Known from his numerous appearances on Pawn Stars, this Sin City legend walks, talks and breathes classic American muscle cars. When he sees a car he wants, he will do whatever it takes to get his hands on it-including making on-the-spot cash offers to unsuspecting owners. 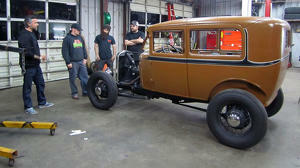 Danny and his team restore, customize and sell cars in a hurry, scrambling to keep their Las Vegas shop in the black. From vintage Thunderbirds to classic Corvettes, toy cars to souped-up sidecar motorcycles, Danny and the crew of Count's Kustoms will stop at nothing to find and flip the greatest rides of all time.